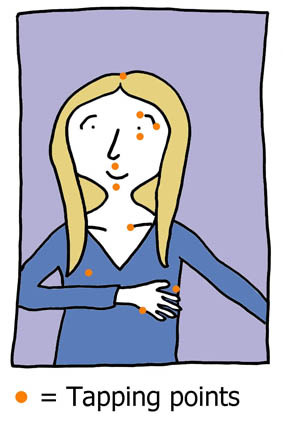 EFT is short for ‘Emotional Freedom Techniques’ – often referred to as ‘tapping’ or ‘acupuncture without needles’. It is a healing technique based on Chinese Energy Medicine, but instead of using needles, energy meridian points are gently tapped using your fingertips. It works by tapping with the fingertips on acupressure points on the head and body while focusing on the issue – clearing energetic blockages, and allowing the problem to heal. Pretty much anything. Tapping is a wonderfully versatile tool. In fact, it can be used on emotional as well as physical issues. One of the great benefits of EFT is that it is unnecessary to relive a traumatic experience. You don’t have to go into the details – we can still use EFT to clear the issue. Does it hurt? Is it difficult? No, this is a very easy and gentle form of energetic healing – also a very powerful one. While the session is led by me (Kate), you also take an active part – and you will always have a choice in how it progresses. Best of all, you leave able to use EFT any time you wish.